Team USA Augusto Perez, James Pierce, Jacqui Kapinowski and Jimmy Joseph. Team USA will celebrate the new year in Falmouth, MA, hosted by the Cape Cod CC. They'll begin with a challenge match starting at 3.30 December 31st and train with the club's wheelchair team through January 3rd. John Cameron reports in the Chronicle Journal that as many as 20 curlers are turning out at the Fort William Curling Club, and there will be a playdown February 1-3 for the right to play in the 2009 Nationals. 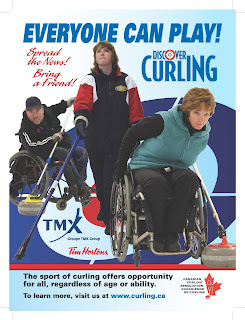 The MEDIChair Wheelchair Curling Association (way to go on the sponsorship, guys) is also planning a cross border challenge in Grand Marais, Minnesota, with the equally active Duluth team on, Jan. 17. If you would like to be part of either a recreational or competitive team, call Dave Kawahara at 577-5818 or the Fort William club at 622-5377. Joe Rea (Prince George BC) coach Playing positions not yet decided. The team includes three players from Team Canada 2008 (Darryl, Ina and Sonja) with Sonja the only holdover from the 2006 Torino gold medal team. *There was very little to choose between any of the candidates, and the delay in announcing the team was to give the coaches additional opportunities to observe the players in meaningful competition. *Sonja Gaudet earned her place with her performance, though there would have been a bias towards taking two women to avoid the risk of default were one to become injured. *There was no regional bias at all. The coaches saw no problem with having an all-BC team. Chris Sobkowicz earned his place by his performance. *Though a sports psychologist works with the team and has input in coaching discussions, team dynamics within the squad were excellent, with every player happy to work for the team, and with any other player. *This team has been selected for the 2009 Worlds only. The squad of eight will be retained and may even be enlarged next year as several people not currently on the squad have caught the attention of TC coaches. *The squad will start with a clean slate after the Worlds and will have to compete for their place on the 2010 Paralympics side. As a keen curler, I am going to push a tonne of granite on a mile of ice to support The Hearts and Heroes Challenge, run by the Sportsman's Charity, with Poppyscotland and Scotland's rugby charity for disabled players, Hearts & Balls. Scottish Rugby's Murrayfield Centenary Fund will also be a beneficiary. Please sponsor me to do this. But don't stop there. have a look at the website www.heartsandheroes.co.uk and think about entering a team or visit this link to see the fantastic sponsorship opportunities from £100 to £5000+. I appreciate that times are hard, but for disabled sportsmen and service personnel, recession is a long term prospect! 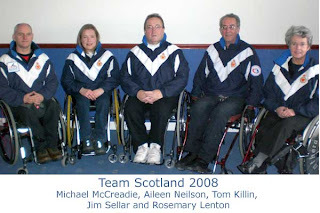 Bob Cowan, in his Curling Today blog, reports the announcement of Team Scotland 2009. There's no change from the team that tied for last place at 3-6 in Sursee, Switzerland inn 2008. My "Wheelchair Watch" column for the December issue of SWEEP! Magazine is now available online. The Lakeshore CC in Lower Sackville NS will host the 2009 Canadian National Championships on March, and expects a record number of provinces to compete. Programs in Saskatchewan, Quebec and Newfoundland/Labrador hope to have teams ready to join the seven who participated in the 2008 event in Winnipeg MB. 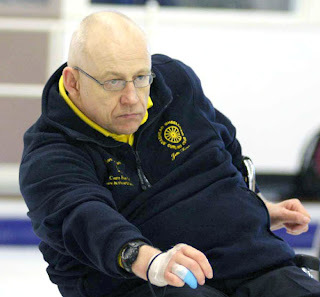 Also growing is the local wheelchair curling program at the Lakeshore; so much so that the recreational program has doubled in size and moved from Mondays to Fridays for better ice availability. The competitive squad now has eleven members and the Provincial team will be selected from this group in January. New curlers are always welcome. For more information call Laughie Rutt at 902-864-2737. “I play quite a lot with Darryl Neighbour here, many times a week, and he’s as good as there is mechanically. You can’t teach experience and that makes the situation a little more complicated. There are very few players here that have any real curling background to draw from ... Able-bodied curling has gotten so good over the past few years since the free guard zone rule that there’s a potential risk of having a 1-0 game in a meaningful event. I call wheelchair curling the roller derby of curling because there’s always spills, action and enough misses to keep it interesting. No lead is ever safe.” Read full article. The eight member Team Canada squad had been told that they would know ten days ago which five players would wear the Maple Leaf at the 2009 Worlds. That date was changed to the conclusion of the Richmond spiel. Today they were informed that they would be told by telephone next Wednesday, December 17th. The reason for the continued delay is not clear, even given that statistically there is little to choose between the candidates beyond (in my opinion) Armstrong, Neighbour and Forrest. Did performances at the Richmond event suggest the need for a rethink? Will past practice be followed with two women making the squad? Will non-BC members Chris Sobkowicz and Bruno Yizek be included to give them the benefit of meaningful international competition prior to 2010? Or a compromise - Sonja Gaudet plus either Chris or Bruno? Or will experience win out and Gary Cormack and Gerry Austgarden hold on to their spots? With six of the squad from BC and entries for the BC playdowns for the Canadian Nationals due by December 22, the choice has implications for BC's playdown teams who will be allowed only two Team Canada members on any one side. You can add your choice for Team Canada 2009 by adding a comment to the couple of dozen guesses already posted on the December 10th Blog post. Alberta proved that their round robin record was no fluke by stealing in the 8th and again in an extra end to post a 7-6 victory over Canada II's Jim Armstrong in the $5,000 Richmond International Cashspiel this afternoon. Armstrong loses!!!! Alberta, with a couple of fortunate breaks in the early going, stole the 8th and extra end to beat Armstrong. Great Britain failed to recover from the disappointment of their semi-final loss, bowing to Richmond 10-6 in the 3 v 4 game, Vince Miele throwing 4th rocks. In the consolation games Canada I beat Manitoba 10-2, and Scotland beat Victoria 7-5. Photographs from the event will be available at the Richmond Centre for Disability's website. The final day of the 2nd Annual Richmond International Cashspiel saw round robin winners Alberta blank 4th place hosts Richmond 15-0 in 6 ends in the first semi-final. Armstrong's Canada II squad took just 7 ends to defeat Michael McCreadie's Great Britain team 13-5 in the other semi-final. Alberta will play Armstrong for the trophy and the $1500 1st prize. Richmond plays Great Britain for 3rd. The sponsors, Hosting BC, the Rick Hanson Foundation, the City of Richmond and the Richmond Centre for Disability, not only provided for a cash prize pool of $5,000 but also gave travel grants of $2,000 to the British team and $750 each to Alberta and Manitoba to help defray expenses. Victoria also received assistance from Hanson's Wheels in Motion. Photographs from the event will eventually be available at the Richmond Centre for Disability's website. Alberta took first place after round robin play on the strength of a tournament best score in the team "draw to the button" test in Draw 3. Their overall mark of 5-2 was tied with Great Britain and Canada II and they will play host team Richmond in tomorrow's semi-final. 1 Alberta 4 2 Win 143"
2 GB 4 2 Win 230"
3 Canada II 5 1 Loss 283"
4 Richmond 4 2 Loss 291"
5 Canada I 2 4 Win 156"
6 Manitoba 2 4 Win 262"
7 Victoria 2 4 Loss 213"
8 Scotland 1 5 Loss 279"
Jim Armstrong chalked up another two wins but because his team's "draw to the button" skills test in Draw 3 was played head to head, their dismal seventh best scoring counted as a loss to Manitoba. Michael McCreadie's Great Britain squad showed some signs of life after struggling for much of the season, and will face Armstrong in tomorrow's semi-final. Gerry Austgarden's Canada 1 team redeemed themselves with two wins, though it took an extra end for them to put away Manitoba. At the end of the second day of the Richmond International Cashspiel, Jim Armstrong's Canada II is tied with Richmond, Great Britain and Alberta at 3-1, with Victoria 2-2 and Scotland and Manitoba 1-3. Gerry Ausgarden's Canada I squad has yet to record a win though they posted the second best "draw to the button" score in the "skills" element yesterday. Consistent with the coaches' insistence that no decision has yet been made about which of the eight squad members competing in Richmond will become Team Canada 2009, Canada I is being skipped by Gerry Austgarden while Jim Armstrong skips Canada II. In the morning draw Great Britain beat Austgarden 8-4, while Armstrong beat Alberta 12-3. It took Manitoba an extra end to defeat Victoria 8-6, and Richmond beat Scotland 6-5. In the afternoon Armstrong beat Austgarden 11-6, Richmond beat Manitoba 7-6, Victoria beat Scotland 10-4 and Alberta beat Great Britain 9-5. Draw 3 was a short session "skills" competition. Each team member drew to the button with the cumulative distance from the button determining the winner: Austgarden (156") over Richmond (291"), Manitoba (262") over Armstrong (283"), Alberta (143") beat Victoria (213") and Great Britain (230") beat Scotland (279"). Team Canada will face the British Paralympic squad during the four day Richmond (BC) International starting tomorrow. With the delayed announcement of which five players will become Team Canada 2009, this event will be a last chance for the eight person training squad to impress the coaches. Canada last faced the Brits in October at a spiel in Kinross, Scotland which ended in a Canada/Canada final. Completing the eight team field in Richmond are teams from Alberta, Manitoba and two local club sides. To no great surprise the on-ice curlers who won America's first medal at the World level last March, have been chosen to represent their country at the 2009 Worlds, and pending approval by the US Olympics Committee, the 2010 Paralympics. The team of skip Augusto (Goose) Perez, James Pierce, Jimmy Joseph and Jackie Kapinowski came through a three stage assessment that began with a formal try-out, and continued over spiels in Ottawa and Utica. Newcomer Patrick McDonald, who had been skipping USA II, joins thee team as the sole west coast representative. CLICK HERE for more information. Augusto Perez avenged a round robin defeat by Bradford, Ontario's Ken Gregory in the first semi-final of the 2nd Annual U.S. Open in Utica, NY today, but he needed an extra end to prevail 7-6 in 9 ends. Bruce Cameron's Ottawa team beat Great Britain I by 9-5 in the other semi. In the final USA I beat Cameron 7-2 for the gold medal, with Gregory beating Great Britain 1 for bronze. Great Britain now travel to British Columbia to compete in the 8 team Richmond International against Team Canada, Alberta, Manitoba and two BC club sides. GB, which is essentially a Scottish squad, have struggled for some time after finishing tied for last place at the 2008 Worlds. They still have players with a great deal of experience, and their funding enables them to travel. It will be interesting to see whether they can raise their game in Richmond or will plead continued experimentation in preparation for 2010 to explain what to their fans is a worrying lack of success. At some point a team has to prove to themselves they can win, and the Scots may be leaving it a little late. Day 2 of the 2nd Annual U.S. Open saw 3 draws, with USA I suffering their first defeat, and Bruce Cameron's Ottawa team seeding #2 in Sunday's playoff. 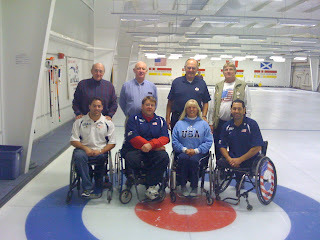 The 2nd annual U.S. Open, featuring the Great Britain Paralympic squad, began today at the Utica Curling Club, NY. Both US teams posted two wins in the opening draws. Canada, played in Ottawa last weekend and will play in Richmond BC next week so did not attend this event, which Great Britain won last year. The announcement of the members of Team Canada 2009 has been delayed until Saturday December 13th, at the banquet at the Richmond International spiel, as happened last year. It should be noted that the proposed line-ups changed shortly before the Ottawa event. This does, however, allow more time for those yet to cast their ballot for Team Canada 2009. Please do so in the comments section in the post below this one. The Great Britain Paralympic squad will begin their North American tour at the 2nd US Open in Utica this weekend. Two British team will compete against the two US teams that played last weekend in Ottawa. Two Ontario teams, Cameron from Ottawa and Gregory from Bradford round out the six team field. The Brits then travel to BC and will face Team Canada 2009, who are to be selected tomorrow (December 4th), at the Richmond International spiel starting December 9th. Quebec wheelchair curlers, based at the Lennoxville CC in Sherbrooke, learned today that their winning participation in the recreational division of the Cathy Kerr in Ottawa has led to sponsorship for a trip to the 2009 Canadian Nationals. Club member Al Whittier, who has been the force behind the program, was delighted. 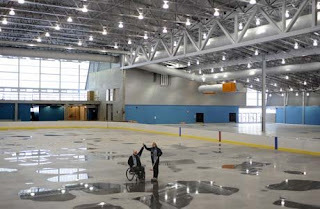 "We were all inspired by seeing the Ottawa ice-sheets full of wheelchairs," he said when he phoned us the news. "And we already have a woman who drove to Ottawa to watch what was happening, and who will coming out to a practice. We need female curlers and she asked about training." This brings up a point that I have been making for several years. If curling wants to attract committed athletes there must be answers to intelligent questions, like what will be my time commitment to excel, what coaching is available, and what is my path to representative competition. As far as I know there is still no "Path To Excellence" type brochure that lays out the support serious athletes will expect from a sport attempting to get them to commit their time and energy.